I was recently asked a question by a friend that made me stop and take some time to think before I responded. Essentially, his questions broke down into three main questions, with the third having a list of passages that could prove problematic for anyone who would want to base their morality on the Bible. 1) How do you base your morality? 2) If it’s based on the Bible, which is supposed to reveal the character of God, how can you (or, do you) pick and choose which parts to follow or not? 3) Take the examples of God not only allowing, but sanctioning even commanding the murder of whole people groups (ethnic cleansing? ), including women, children and non-combatants (Canaanites). How is this “moral” and what does it reflect about God’s character, as well as the character of those people who seek to reflect His character? I am going to post my answers to these question in two blog posts. The first (this one) will address the first two questions, and the next post will address the third question. Q: How do you base your morality? A: I would say that I base my morality on the gospel – the Good News (literal meaning of gospel) that God does for me and the world what the world and me can’t do for ourselves – as revealed in the Bible, not on the Bible itself. For more, see next question. Q: If it’s based on the Bible, which is supposed to reveal the character of God, how can you (or, do you) pick and choose which parts to follow or not? A: The Bible does in fact reveal the character of God, but it is not simply a collection of God’s characteristics in the abstract. It is about His character in action. What we know of God is first and foremost revealed to us by Him. It is not merely conjured up or developed from the human mind (whether collective or individual); the direction is not from the human to the divine, but from the divine to the human. This means that what we know about God is set in the context of recipients who are themselves not-God. But more than that, what we know of God is also set in a context of sin, or what one philosopher describes as “vandalism of shalom” – Hebrew for peace, meaning universal human flourishing and a webbing together of all humans and all things in a rich state of affairs where natural gifts are employed and needs are met. In a phrase, the context we live in is a world that is “not the way it’s supposed to be.” (Cornelius Plantinga, Not the Way It’s Supposed to Be: A Breviary on Sin). In this context, all humanity is both complicit with and impacted by sin; we are at one and the same time both victims and victimizers (borrowing from Miroslav Volf, Exclusion and Embrace). And before you dismiss this statement by saying, “I have not harmed anyone or done anything wrong/bad/evil,” ask yourself if you really believe that you are so completely disconnected from others in this world that your actions do not impact – whether directly or indirectly – the lives of others. This is what theologians refer to as “sins of commission” – those things we do that are wrong, unjust, and harm others – or “sins of omission” – those things we leave undone that are right, just and seek the welfare of others.” Voltaire famously said, “No snowflake feels guilty in an avalanche.” We are caught up into a system of human relationships where our actions or inaction impact others, and most of us are simply oblivious to this reality. Just watch The Place Behind the Pines or Crash for modern cinematic examples of this fact. Now, so far I have described the context of human life and sin in a horizontal dimension – the impact we have on our fellow man. If you take that as your only dimension, the problems we face are bad enough as it is. But if we take the world we live in as a product of a Creator’s design, delight and intent, then we have to add a vertical dimension to the horizontal. How we live then, not only impacts our fellow man or the environment, but also our relationship with One who created us. If we can turn the world we live in and create an environment that is not the way it’s supposed to be, what would the One who created it in the first place think of our actions and inaction? In a word, displeasure. But that sounds too shallow, or calm. Afterall, you and I experience more passion when someone disses a band we like or a movie we loved. Could you imagine someone actually threatening, abusing and destroying another human being you deeply cared about? Or a work of art that was a labor of love and you spent countless hours developing? If He created the world, and us to live in it because He delighted to do it, then we can and should assume that our attempts to live life in ways that thwart or disrupt that creational intent for peace and human flourishing would invoke God’s anger. Now if He were angry at what had become of His creation, He has a couple of choices: a) scrap it all and start over, or b) put in place a plan to “redeem” (buy back, purchase, reclaim ownership) and “restore” (fix, repair, make new again) His creation. This is exactly what the pages of the Bible in the book of Genesis tell us. Genesis 1-3 is the historical account of God’s creating all things, declaring them good, commanding His crowning jewel of creation, man, to live in a state of love and trust with Him and carry out his task of doing in creation what God had done for creation – manage and cultivate it with benevolent care and peace-full intention. When man instead breaks that state of love and trust (yes, I have the Pearl Jam song playing in my head as I write that), God inserts himself into the situation and interjects His solution – a promised redeemer and rescuer for all creation (cf. Genesis 3:15). In the meantime though, all of creation lives under a curse – the inevitable outcome of choosing to love and trust in self instead of living in dependence on God and carrying out our original intention as humans made in His image. This is why I say that I get my morality from the gospel as revealed in the Bible, instead of the Bible itself. The Bible is a collection of recorded works that describe who God is but also what He has done and is doing, in this world to fix the problems, right every wrong, and ultimately wipe every tear from every eye. 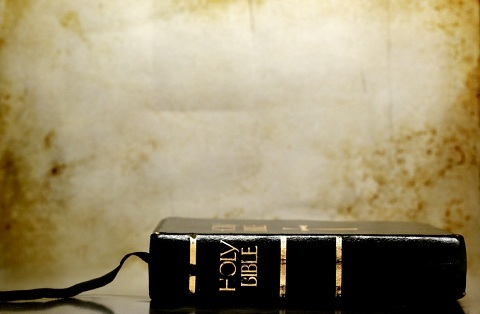 I can derive my morality, or ethical lifestyle choices from the Bible to be sure, but only in the context of the gospel, because that is ultimately what the Bible seeks to communicate. It is not a moral play book, or a divine guide for a good and happy life, sent down from on high to educate and provide the steps needed to live a certain way. It includes that, but it is not merely that. It is first and foremost a revelation from God to us, highlighting who He is, who we are, what’s wrong with the world, and how He intends to put it back right. This allows one to see the connectedness of all scripture and how each individual part (verse, passage, book, genre, collection, testament) fits together to make a composite picture, or mosaic, of the character in action (God) and the implications for His creatures (man, included). Creation (Gen. 1-2) – Fall (Gen. 3:1-14) – Redemption (Gen. 3:15-Rev.19) – Consummation/New Creation (Rev.20-22).